You too can paint your favorite meme in light with just a few tools. [Skywodd] brought together a couple of different projects to make this happen. He had already built a large POV display and now uses a DSLR with long exposure to create light paintings (translated). 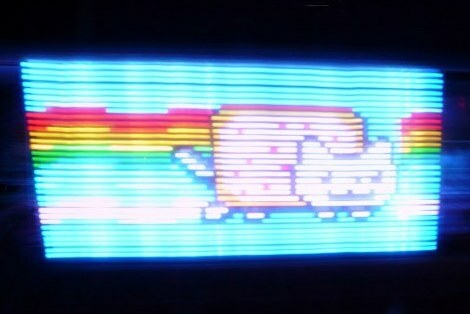 The Arduino-powered display is built from a strip of 35 RGB LEDs. Now, that’s four pins per LED but one of is ground, leaving just 105 pins that need to be addressable. A couple of things make this manageable. First, he etched his own circuit boards for the LED strips. This breaks out the contacts to the edge of the boards and simplifies the soldering a bit by taking care of the ground bus. Secondly, he’s using M5450 LED display drivers for addressing. After the break you can see the video of the prototype hardware (in French but blinky action starts at about 2:30). If you’re looking for an easier way to do this, check out the light painting that uses manufactured LED strips. it’s a glitch in my source code, i’ve simply make a for loop like: for(i=0; i<=n; i++) and read an array of n elements with i as index. This stupid mistake have been corrected before submitting the source code on my blog. He says in french that it’s a bug in the code… He reads 50 sequences (numbered 0 to 49), but in the code he actually iterates from 0 to 50 and therefore reads some invalid memory for the last frame. This is pretty cool really. You could mount this on the side of your car. Most people would just see a “light bar” on the car, but move your head just right and then you see the whole image. I made a clock like that. Normally, you just see a row of lights, to tell the time you had to shake your head back and fourth. This could freak some people out. One time they see an image, when they “look at it”, all they see if the light bar again.